This year we were hosted by the Windsor/Slough Marriott Hotel for a day of presentations and networking. Throughout the day, guests were treated to a plethora of keynote speeches from our internal directors; our sponsors, Paragon Bank and prolific explorer Sir Ranulph Fiennes. Sir Ranulph was a captivating storyteller, allowing us a personal insight into his time travelling the Antarctic wilderness, the people he lost and the process of receiving the prestigious OBE award. We found that not only did his tales prove interesting to hear, his words were inspiring. Sir Ranulph is no stranger to pushing the limits of what is thought to be achievable within his field. This is a message which resonated deeply with us here at AFS. Although we are yet to plan our own arctic expeditions, we are already pushing the boundaries of limitations within the finance industry. Our unique Broker in a Box solution changed the asset and commercial finance landscapes, allowing brokers to operate without the limitations of handling their own compliance, freeing them to be their very best. The Finance Job Campaign turned heads at expos across the country, adding vibrance and personality to a classically corporate field. Finally, we have nurtured a close-knit community of franchisees, ARs and funders which has blossomed into a growing family of finance professionals. It is because of reasons like this we use the hashtag #StrongerTogether. The evening saw us travel to Windsor races for an evening of drinks and socialising with our host for the evening, comedian Aaron James. 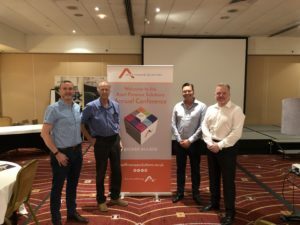 Events like our annual conference are a great opportunity for us to catch up with AFS franchisees and representatives from around the country. In a world where email culture has made our colleague interactions all too impersonal, events like this allow us to get some valuable facetime with our peers from around the UK. But what did our franchisees think of the event? ‘It was the best one I have attended without a doubt. The venue was absolutely superb. Everything was spot on’. – Matt Vaughan, W2 Finance LTD.
‘Many thanks again for putting on a fantastic conference. We appreciate that a lot of effort and funding goes into these events on your part. We come away from every event with something valuable […] It also reminds us of what a unique and fantastic outfit we are lucky to be a part of. Thanks again’. – Peter Lloyd, Salinas Corporate Finance LTD.